For opening hours information, please contact Centre Kirkland & Centre St-Charles directly. Centre Kirkland & Centre St-Charle offer more than 44 brand name stores. Centre Kirkland & Centre St-Charle is located in Kirkland, Quebec - 2995 Boulevard Saint-Charles, Kirkland, QC H9H 3B5 (GPS: 45.450777, -73.85811). Look at the list of stores in Centre Kirkland & Centre St-Charle, hours, location and information about mall and special events, sales, coupons. You can choose store from list below and get detail information - other stores locations for the brand, location, shopping hours, phone, map, directions contact. Centre Kirkland & Centre St-Charle is one of the best shopping place for spend your free time - mall/shopping center has all types of stores - outlets, department, fashion, traditional and more. Have you ever visited Centre Kirkland & Centre St-Charle? Do not forget to write shopping review and rate your satisfaction. 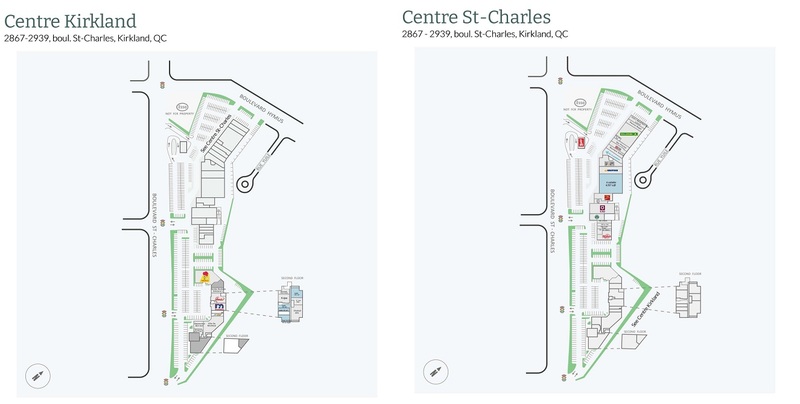 Centre Kirkland & Centre St-Charles is located right next to Autoroute 40, take Exit 50. Access from Autoroute 20: take Exit 48, join Boulevard Saint-Charles and continue in direction to Kirkland. To get directions click on the button above the map. Give us your experience with Centre Kirkland & Centre St-Charle by writing a short review.